Does God ever make mistakes? If you've ever wondered what God is doing, you should meet Philip. What is going on over there? Why is that crowd of people around that man? Haven't you heard? That man is Philip. He has come to Samaria to preach about Jesus Christ. He is also healing people — people who have never been able to stand up are now walking. I want to hear more about this. Let's go closer. I am not healing this person in my own name, but in the name of Jesus Christ. Jesus, who was sent from God, came to earth to give Himself to save us from our sins. Listen and believe. One day an angel came to Philip and told him to go on a trip. Philip, I am an angel from the Lord. I have a message for you. I am listening. Please tell me. The Lord is telling you to go south to the desert road. It's the road that goes down from Jerusalem to Gaza. (reverb: whisper) I'm not sure why I'm on this deserted road. I think I'll ask God what He wants me to do. Father in heaven, you sent me to the country of Samaria to preach about your son Jesus. So many people were being healed by your power. Even more people accepted Jesus as their Savior. So many people wanted to know more about you. But then, you sent an angel to tell me to leave Samaria and walk down this deserted road. I have obeyed you, Father, but I am confused. Please show me your purpose in sending me here. In Jesus' name, I pray, Amen. I am the Holy Spirit of God. Look, ahead. Do you see that chariot? Go to that chariot. Stay near it. I see it. I'll run to it. There was only one chariot traveling on this lonely desert road, and in the chariot was an official from the country of Ethiopia. This man was very important in his country because he was in charge of all the wealth that belonged to Candace, the queen of Ethiopia. But, this man was also interested in God. Excuse me, sir. I see that you are reading the Scriptures — the book of Isaiah. Do you understand what you are reading? How can I understand it? I've traveled all the way from my country of Ethiopia to the city of Jerusalem to learn more about God. I've read and read about God, but I still don't understand. Can you explain it to me? Here is what I was reading. It says "He was led like a sheep to be killed. Just as lambs are silent while their wool is being cut off, He did not open his mouth. When He was treated badly, He was refused a fair trial. Who can say anything about His children? His life was cut off from earth." Tell me, please. Who is the prophet Isaiah talking about? Himself or someone else? Philip started at the beginning and told the Ethiopian official the good news about Jesus. Jesus is the person Isaiah was talking about here. Jesus is God's only Son who was sent to this earth to save us and to bring us back to the grace of our Father in heaven. If you believe in the love that Jesus gives to you, you will be given a new life. 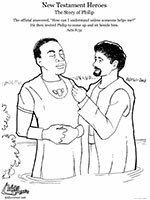 After the official listened carefully to Philip, he believed in Jesus and wanted to be baptized. Dear friend, as a new believer in Jesus, I baptize you in the name of the Father, the Son, and the Holy Spirit. When the two men came up out of the water, the Spirit of the Lord suddenly took Philip away to another city. The Ethiopian official did not see him again but he was filled with joy because he now belonged to Jesus. I'm so happy. I finally understand what I have been searching for. I have found the love of Jesus. I must hurry home so that I may spread my joy to everyone else. There are so many people to tell. When God tells us to do something, he doesn't always tell us why right away. Because Philip obeyed God's command, the good news of Jesus was spread to the country of Ethiopia. If you want to know more about Philip, read the book of Acts in the New Testament part of your Bible.